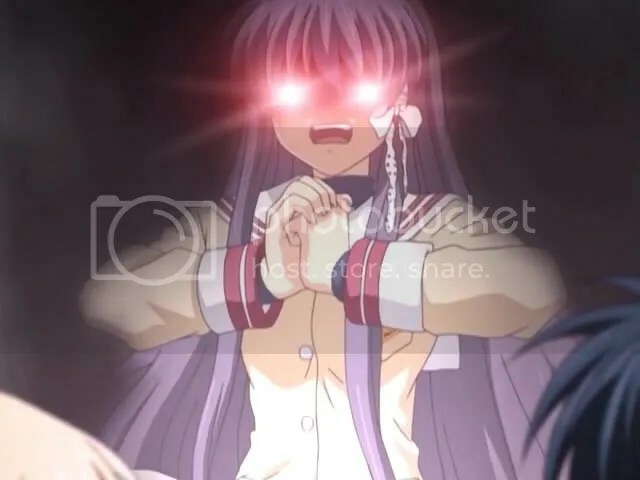 Yosh, minna-san. Again and again, I have to apologize for the late posting of this episode. It seems that [SS-Eclipse] release is later than usual and my commitment as a student has catch up on me. 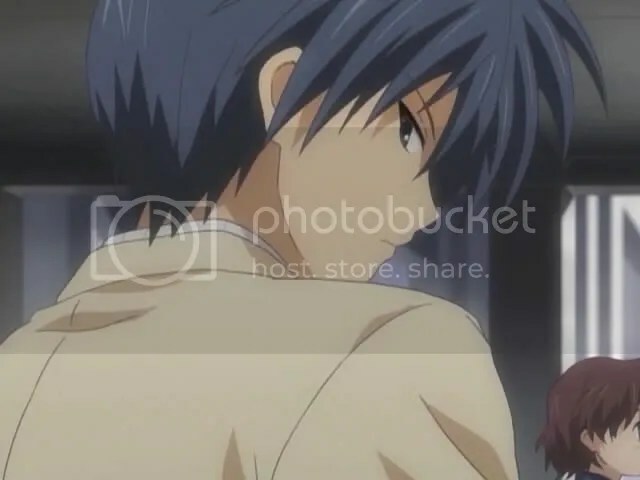 My screencaps for Clannad ~after story~ usually come from their release. 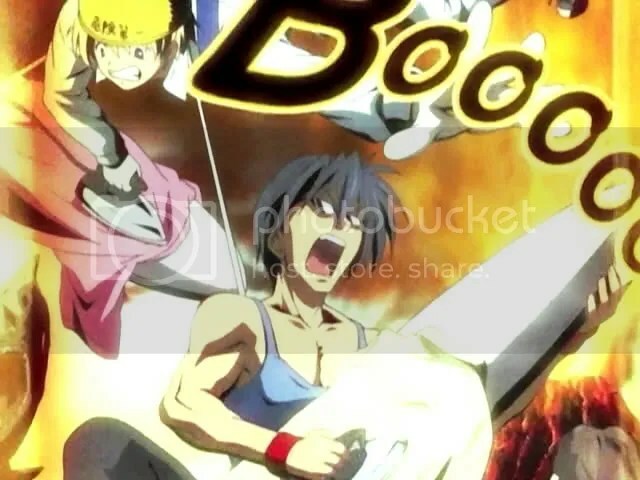 But anyway, this maybe the last episode I will be reviewing until DVD special Recap episode come out later on. I’m surpised that I make a lot of screen caps for this episode too. 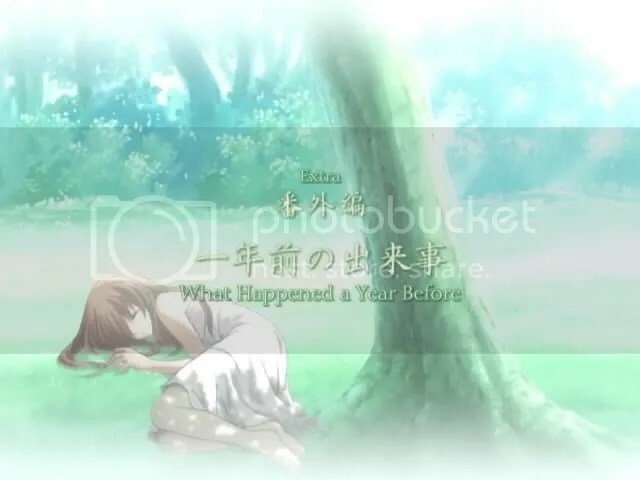 So I hope you enjoy this anime series as much as I do. So let’s move on with the summary and review for this episode! 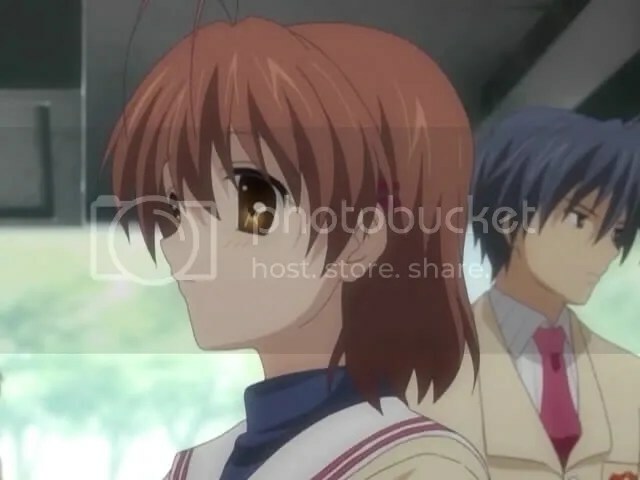 This episode revolves around when Nagisa starts her schooling as third-year student. Unfortunate for her, she does not has any acquaintances in her new class . Her friend, Kimura-san reassures her that she will be able to make friends because she is cute. 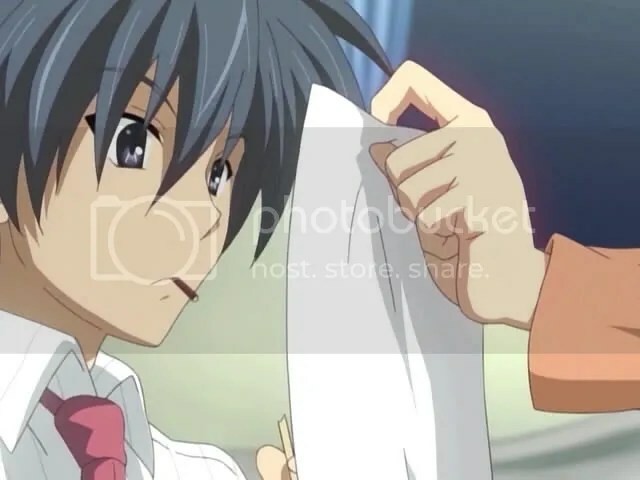 While looking at the notice board, Tomoya bumped into her. 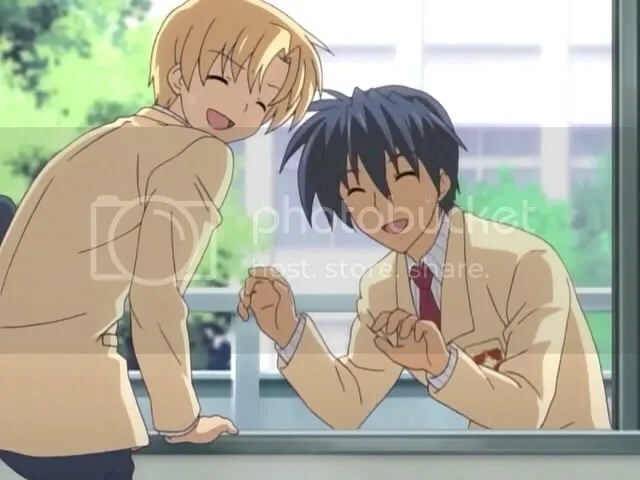 Nagisa apologises to him with Tomoya doesn’t care much about it. During this time, both of them didn’t know about each other until later time. BTW, for those who doesn’t notice. 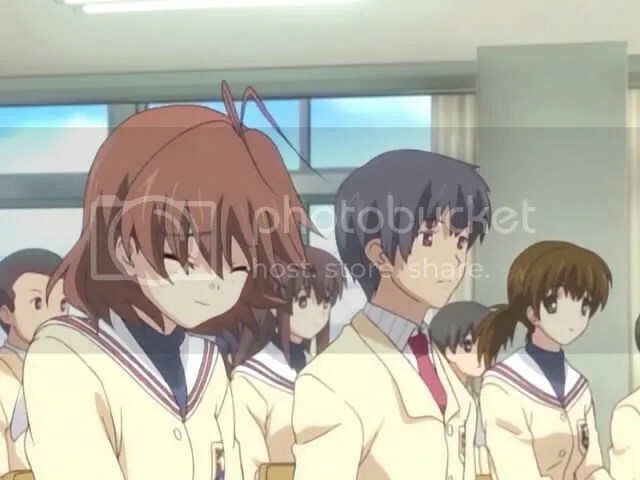 There’s Kotomi lurking among the crowd in this part of episode. 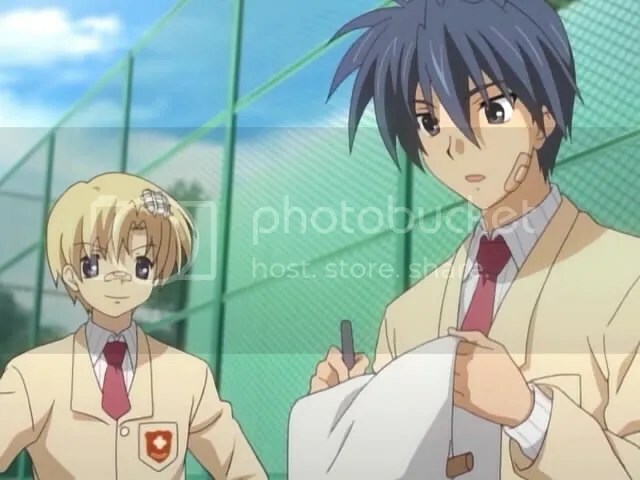 Tomoya and Sunohara had been punished for trying to escape from a class. So they had to make a welcome banner with the supervision of Kyou. At first she was relented to associate with them due to their nature. 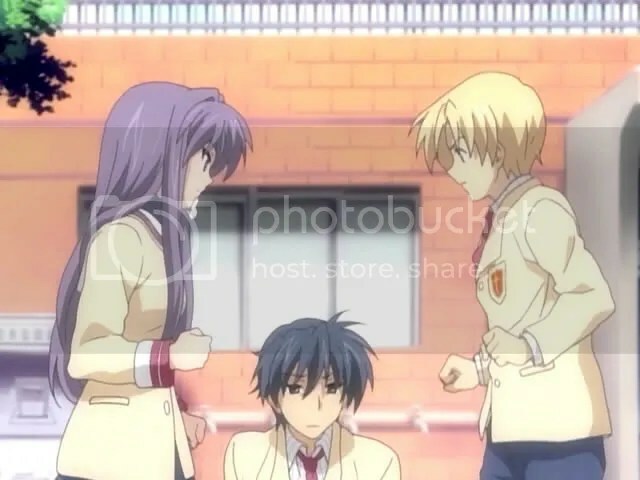 After Tomoya save Kyou from being hit by the boards (Sunohara being the victim here), Kyou opened up herself to them. Back at home, Akio was dissapointed at his daughter for not making friends at class. While giving her a bit lecture on being proactive on relationships, he gives an absurd advice for her to follow. 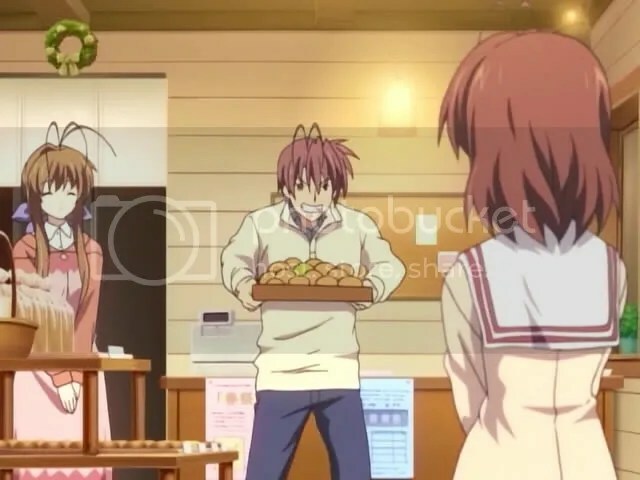 Not only that, he ask Nagisa to share Sanae’s bread to her class. He was sure even that was too much to ask for. 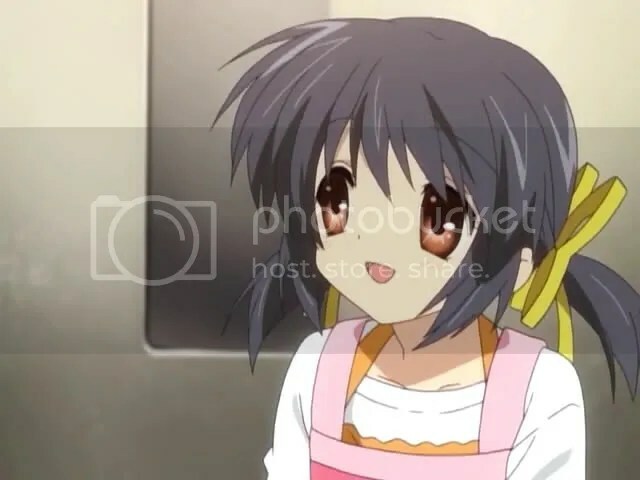 Hearing that, Sanae’s ran off from the bakery before Akio proceeding to chase after her. At school, she decided to follow her father’s advice. While, everyone in the class is praising her, she mentioned that she’s make a mistake and sorry for being a clumsy girl. Hearing that, the crowd laughs at her. 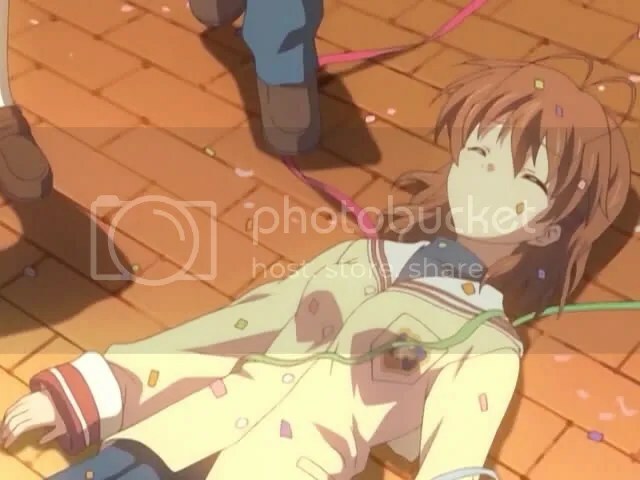 But all that was a daydream for Nagisa. She embarrasedly do not want to proceed of following her father’s advice. Her behaviour attracts a girl in the class during that time. 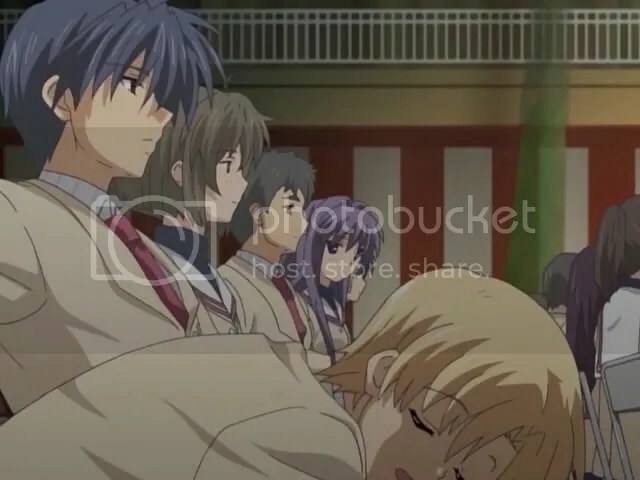 Meanwhile, Kyou spotted Tomoya sleeping on the grass. 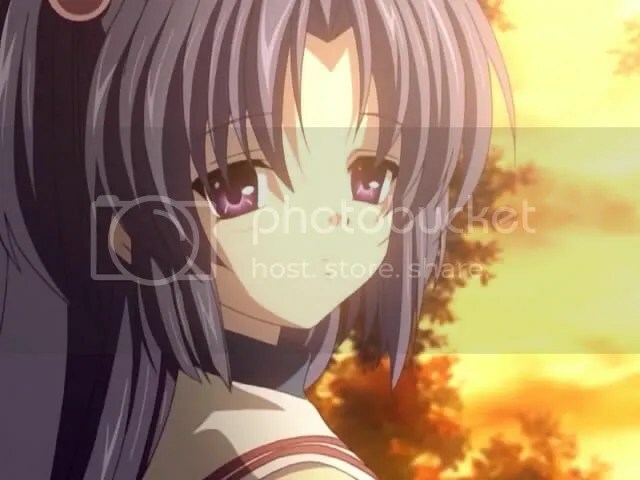 She noticed that Tomoya is not a bad looking person and wondering whether he has a girlfriend or not. 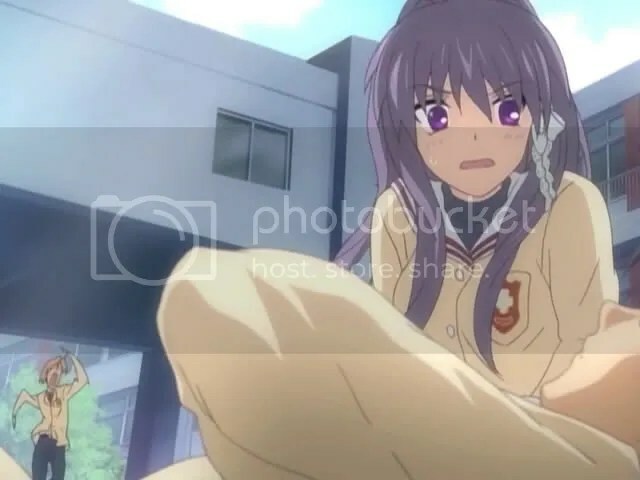 While walking, Sunohara caught Kyou in the act. Afraid that her act is being exposed by Sunohara, she punched Sunohara before he can blurt it out to Tomoya. 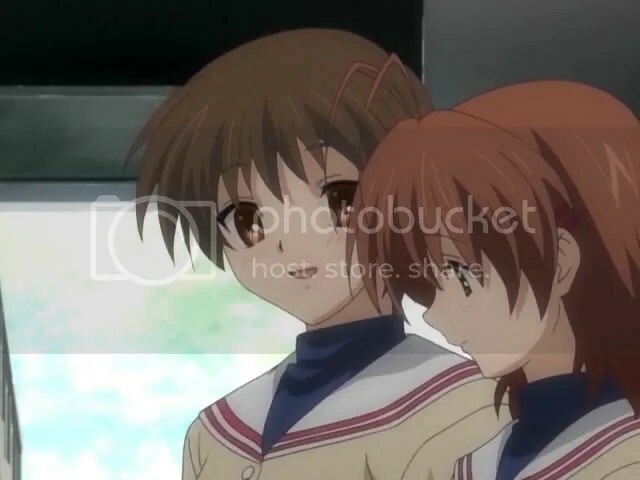 While on the way out from school, Nagisa was invited by her Kimura to go out shopping for clothes. 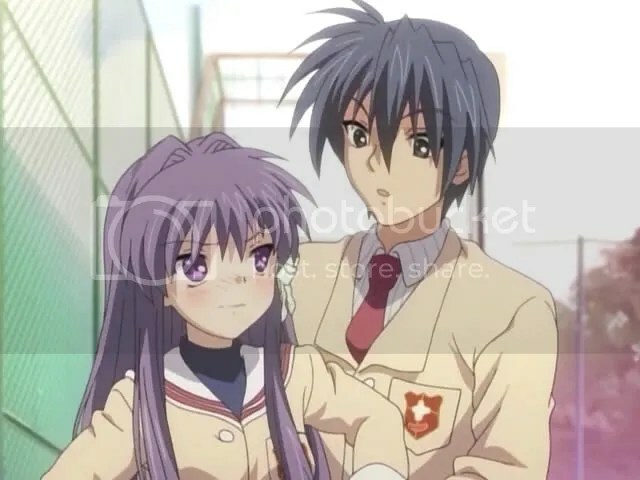 Kimura managed to convince Nagisa despite Nagisa’s reluctance to do it. 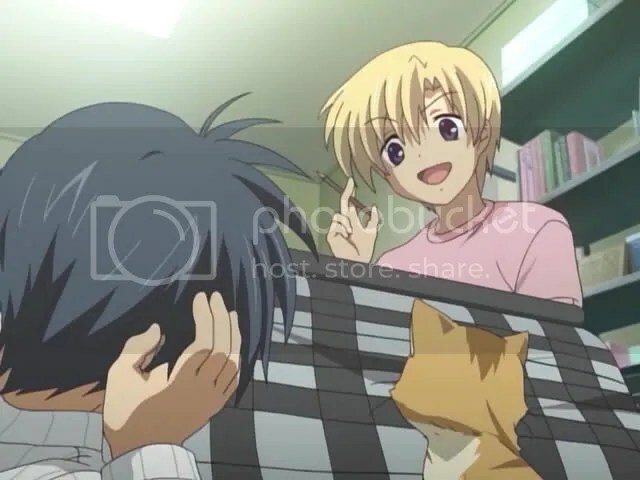 While shopping, Kimura and her friend played a trick on Nagisa. 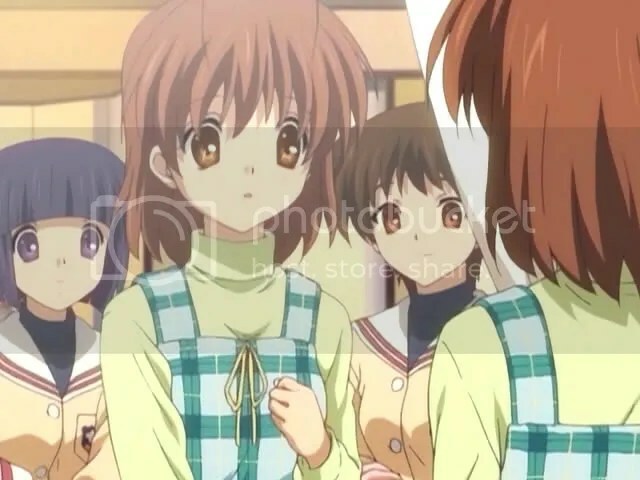 They make Nagisa think that the teacher is coming. Thinking that she has been caught by the teacher, she immediately apologise while coming out from the dressing room. 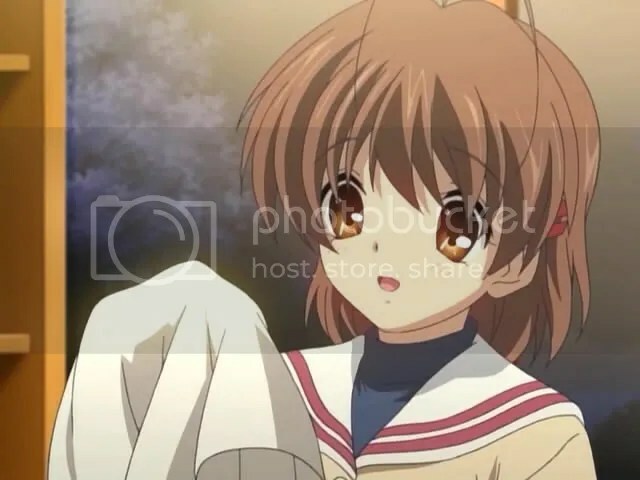 On the way home, Nagisa’s friend apologised to her for playing tricks on her. 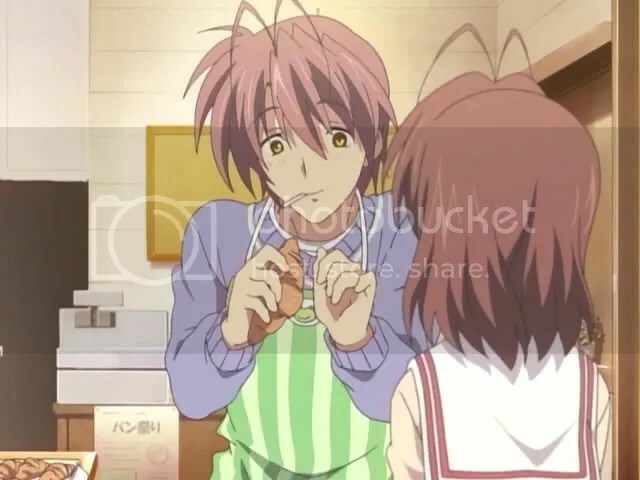 Kimura can’t resist it because Nagisa is such an interesting person. 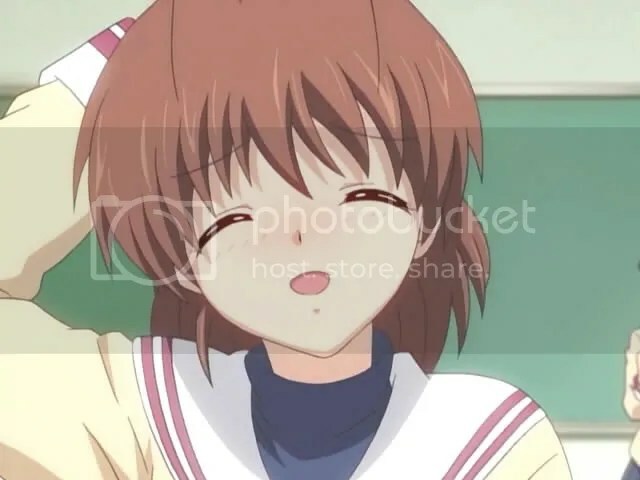 Back home, Nagisa still didn’t solved a problem of finding a friend in her class. Akio gave her a lecture before proceeding make a crazy suggestion to her. 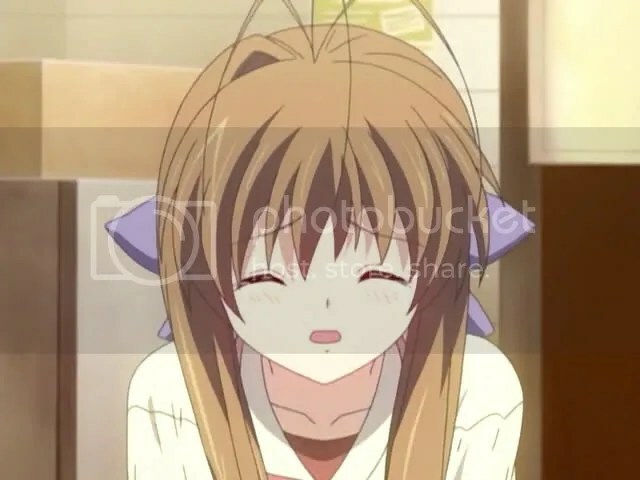 This upsets Sanae before she ran away from the store with Akio right on her tail. 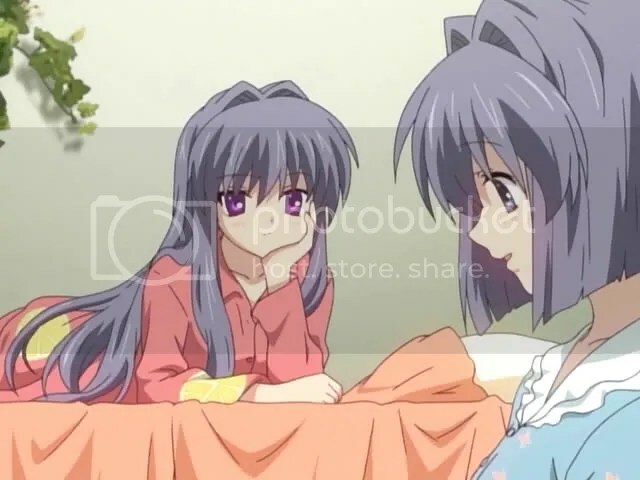 At Fujibayashi’s household, Ryou was practicing her fortune-telling skill while her sister look on. 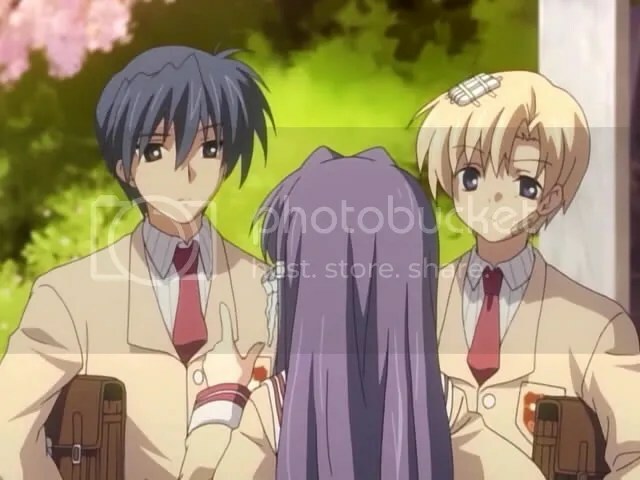 Ryou predicted that Kyou will get a confession the next day. 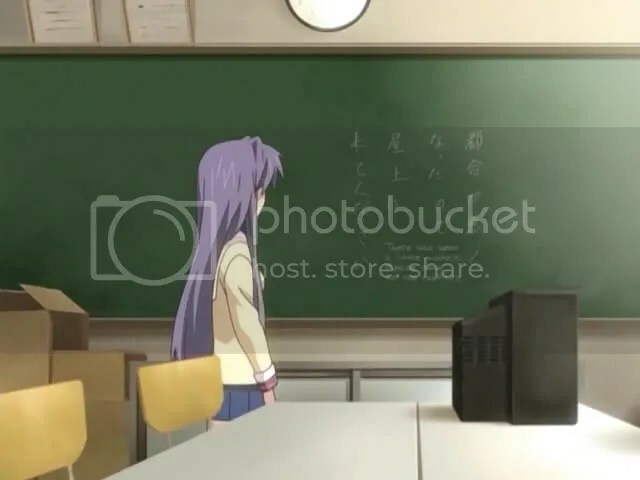 At Sunohara’s place, Sunohara had created a diabolical plan towards Kyou. 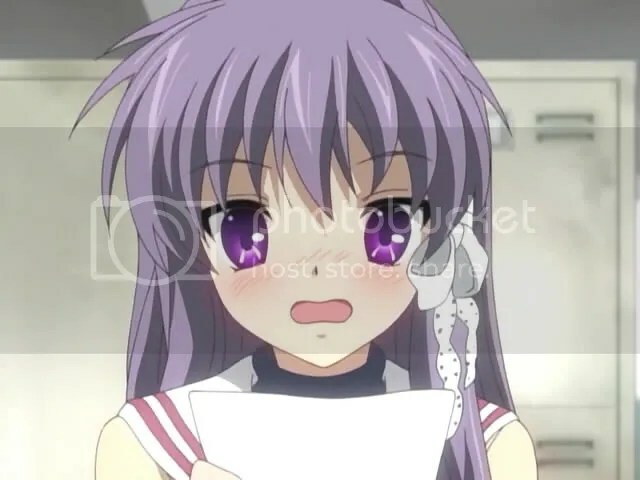 The next morning, Kyou received a confession letter saying that they should meet at the reference room. 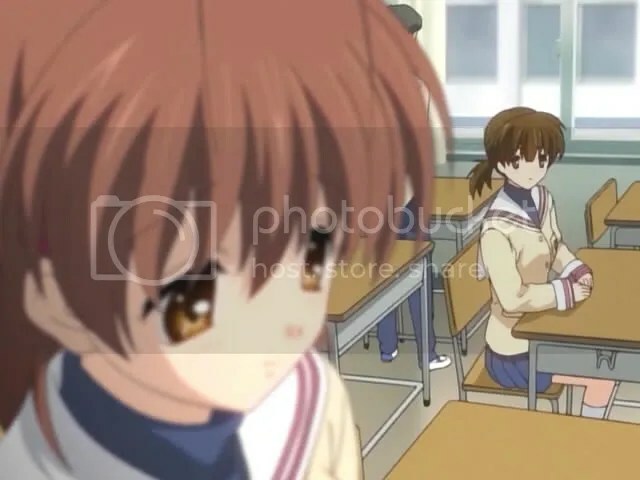 Looking on, the mischevious Sunohara and Tomoya spied on her. Meanwhile, that day is a day where freshman starts their school session. When one girl pointed out that a one person has similarity with a mascot character. 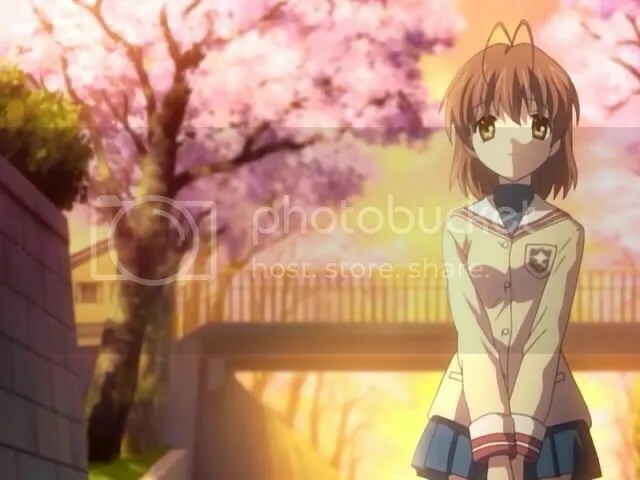 Eventhough, Nagisa knows the mascot character (Dango). 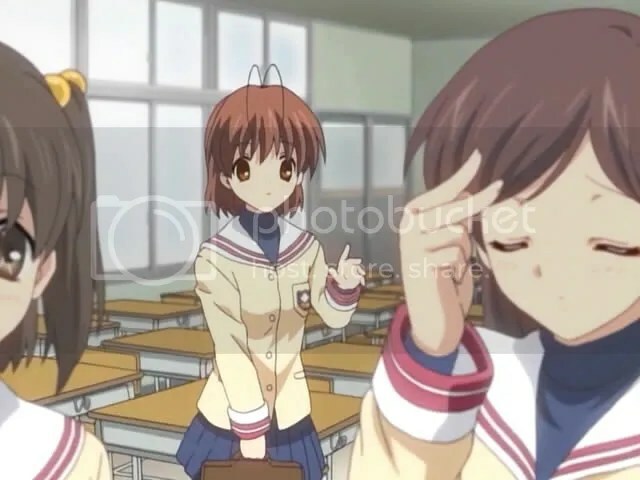 Just as Nagisa wants to answer that, their teacher came in thus lose herself to do it. 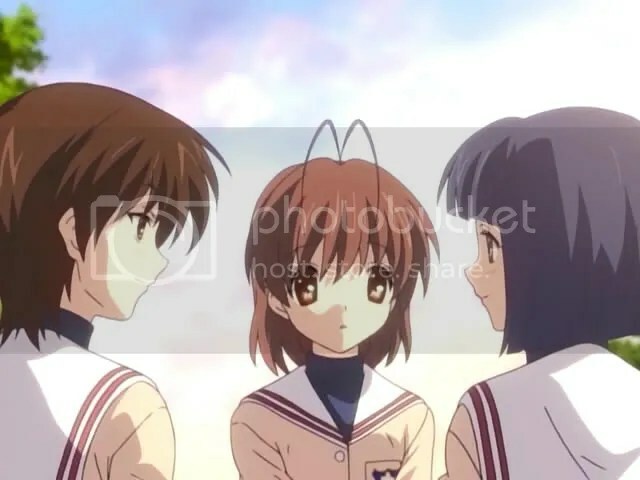 The girl from before looks on at Nagisa’s failed attempt to make friends. 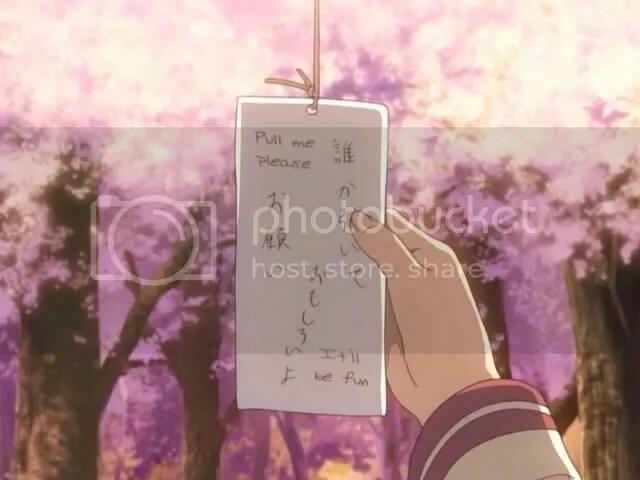 In Opening Ceremony, Kyou was still feeling nervous about the confession letter while taking a glance towards Tomoya. 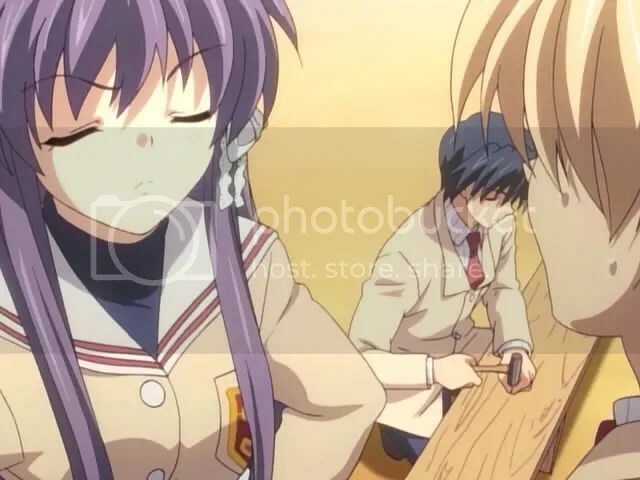 Thus, starts a game between Kyou and supposedly imaginary guy who want to confess his love towards Kyou. 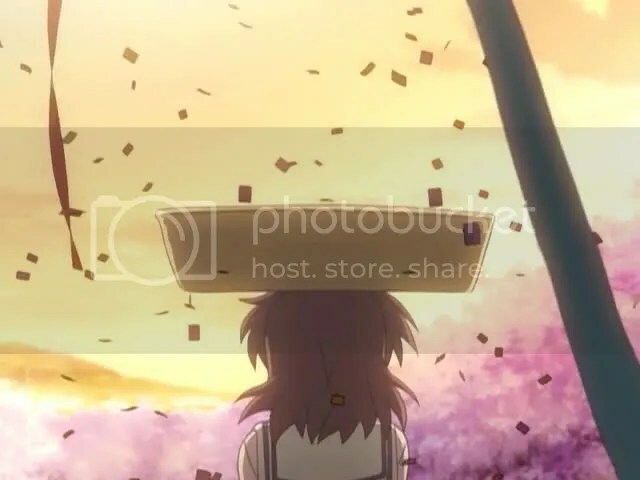 Everytime, Kyou reach her destination she was asked to go to another place. 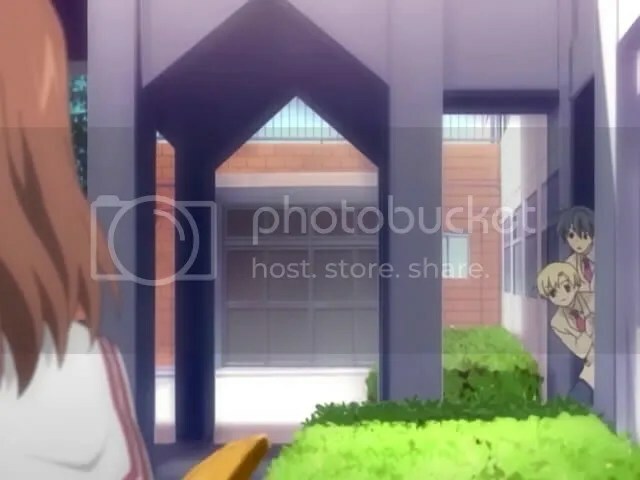 Sunohara and Tomoya spied on her while having fun with it. But at long last, their jig was up. 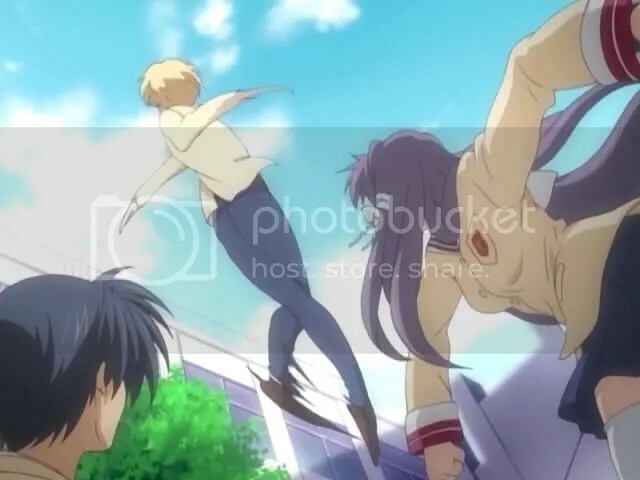 When Kyou managed to catch up with them and finally ended up beaten them. Sunohara has a knack to create pranks. This time they create a prank on freshmens, so when they pull a string something will come out. 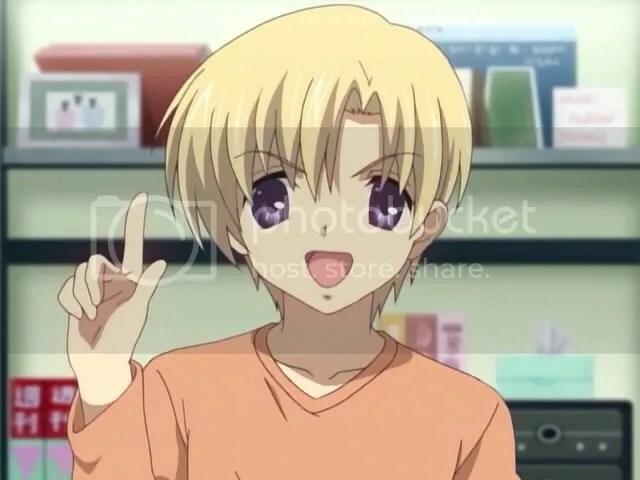 Sunohara had come out with several crazy message to the victim but most of them are disagreeable by Tomoya. 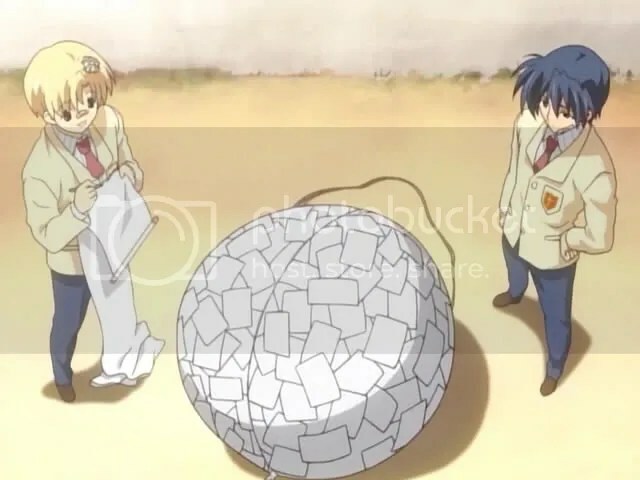 Finally, Tomoya write them down instead. 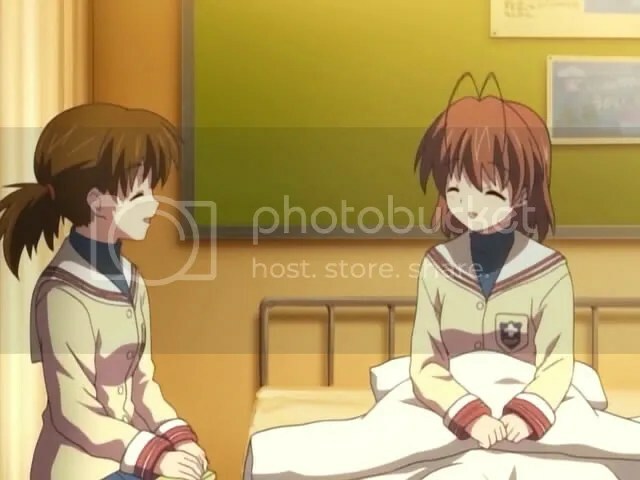 Nagisa ended up in the infirmary ward with the earlier girl waited for her. 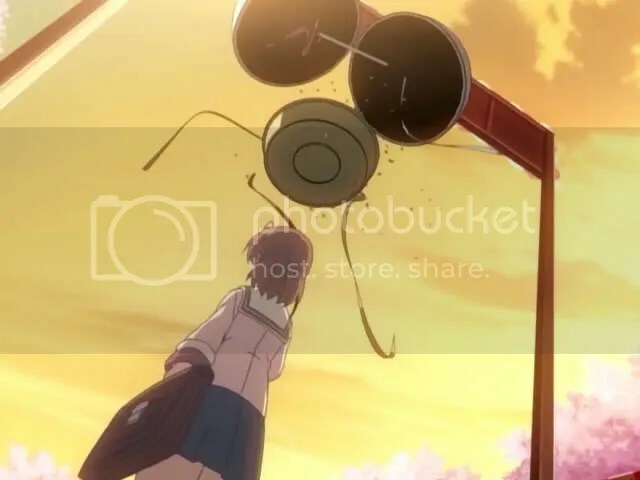 Because of the incident with the pan, Nagisa ended up making a friend. 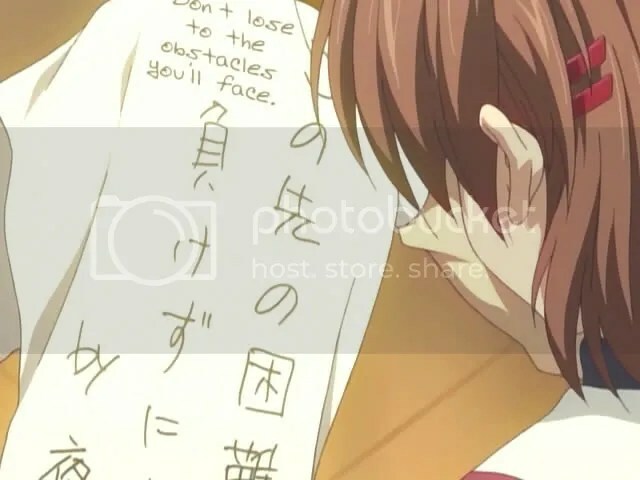 At Fujibayashi’s place, Kyou complained to Ryou that she had classmates who always making trouble for her but she doesn’t mine all that as Ryou pointed that out. 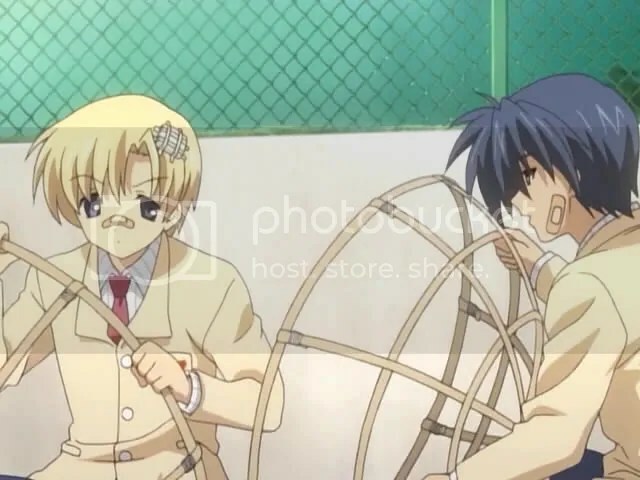 Meanwhile, Sunohara was up to no good again, devising a new prank with Tomoya with a sigh mentioned that they have a lot of free time to do this. 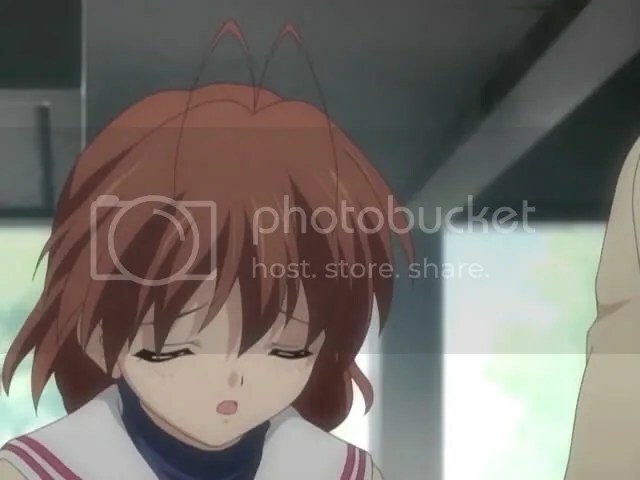 Meanwhile at Furukawa’s place, Nagisa is thankful that if not of the prank which is pull on her, she wouldn’t able to make friend and gather courage to speak up. 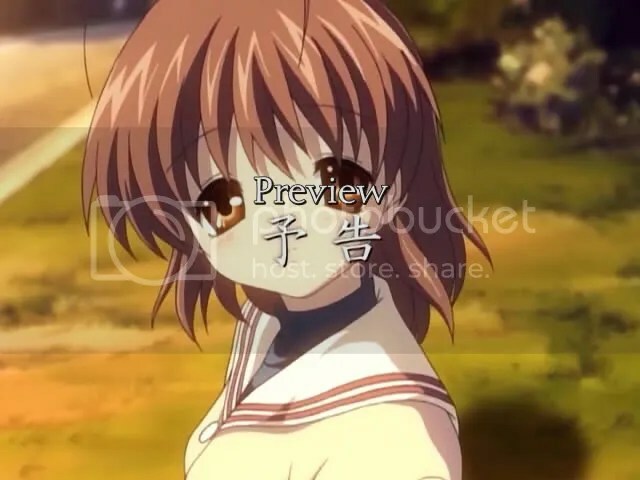 Looks our expectation to get an OVA for certain character has been dashed off with this preview. Nevertheless, I will enjoy this to the fullest eventhough this is just a recap episode. In my opinion, this show is good change from the mood which has been set for the ~after story~. 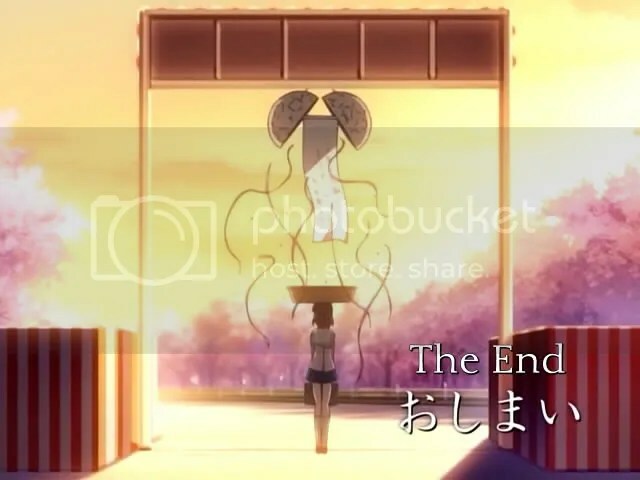 This episode has a similar mood like in Clannad. 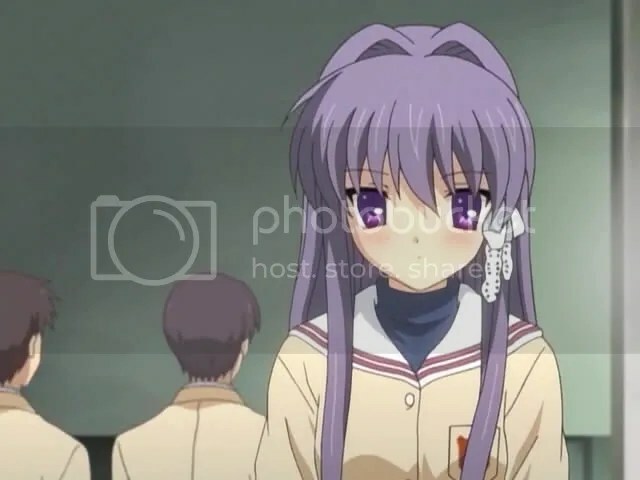 Eventhough, it is a bit dissapointing that they didn’t any OVA for a certain character(Kyou). But still I will be looking forward to the recap episode. Expect the Recap episode review post will come out late again!